Farewell to Ernest Borgnine, whose marvelous portrayal of the love-deprived Marty in the 1955 classic Bad Hair Day Movie earned him the Academy Award for Best Actor. You know you’ve got to start working on those self-esteem issues when you find yourself identifying with hangdog Ernest Borgnine in this classic Cinematherapy flick. Well, he is brilliant in this raw portrayal of a guy and a gal who “ain’t such dogs” after all, even if they do get ditched and dissed right and left. 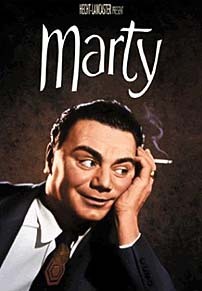 When Marty (Borgnine), a Brooklyn butcher, rescues a not-so-fair damsel in distress (Blair) at the Stardust Ballroom, he realizes that maybe happiness won’t elude him forever, despite his painfully honest declaration to his worried mama that he’ll never get married—”I’m a fat, ugly man!” he cries, and every split end in your world will seem magnified as you burst into tears at this mirroring of your own self-loathing. Fortunately, as Mother always said, every pot finds its lid, and when Marty gulps, opens his frog eyes wide, and asks, “Are you … a Catholic?” you just know that these two will live happily ever after, free of stubborn grey and overprocessed ends. Brutal and beautiful. Watch Marty as you do a mud mask and manicure and you’ll be feeling like a wallflower turned heirloom rose in no time–but until then, avoid all mirrors lest you unleash a piteous crying jag.